Well, it isn’t only in Europe that we are having a hard time of things. 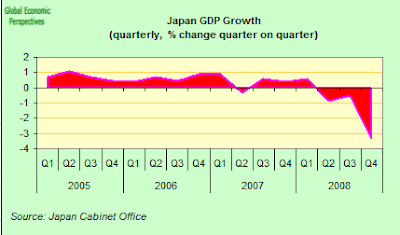 Last week Kazuo Momma, head of the Bank of Japanâ€™s research and statistics department, warned that Japanâ€™s economy now faced an â€œunimaginableâ€ contraction, and today we can begin to see just what the unimaginable might look like, since the preliminary data for fourth quarter GDP are now out. And what we find when we come to stare the unimaginable in the face is that Japanâ€™s economy contracted by 3.3 per cent in the three months to December (compared with the previous quarter), effectively the country’s worst economic performance in 35 years. On an annualised basis, gross domestic product declined at a rate of 12.7 per cent, a number which perhaps better than any other highlights the depth and severity of a slump that has surely now dispelled all those early hopes that the global economy might be able to shrug off the effects of the financial crisis just like that. To puts things in a comparative setting, the contraction was three times as bad as that of the US in the same quarter. Year on year GDP was down by 4.6%. 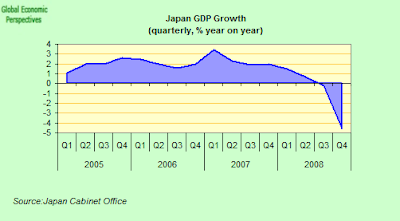 This quarter’s big slide in GDP was in fact the second-worst the country has experienced in modern times, lying just a thin hair’s breadth away from the record 3.4 per cent quarterly contraction clocked up in 1974, in the wake of the first Middle East oil shock, and well beyond anything Japan’s economy has experienced in what is now the “lost decade and a half”. The slowdown was pretty generalised, but lead most decisively by exports which plunged an unprecedented 13.9 percent from the third quarter (see chart below). In fact Japan has become systematically more dependent on sales abroad for growth over the past decade, and overseas shipments make up 16 percent of the economy today compared with about 10 percent in 1999. Domestic demand, which includes spending by households and companies, made up 0.3 of a percentage point of the contraction, while capital investment fell 5.3 percent. Manufacturers cut investment spending by a record 11.3 percent in the quarter, indicating they have little need to buy equipment as factories lie increasingly idle. Consumer spending, which accounts for more than half of the economy, dropped 0.4 percent on the quater, as exporters began firing workers. After ten years of sacrifice and reform, it must be pretty shocking for most Japanese to discover that their economy is still in “terrible shape”. 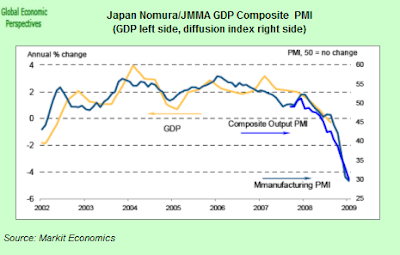 Evidence of Japanâ€™s slowdown can now be found right across the economy. On Monday the countryâ€™s electric utilities industry association said that power generation had fallen 6.4 per cent in January as the industrial sector rapidly winds down. This was the sixth straight monthly decline and the steepest fall since a 6.9 per cent drop recorded in July 2005. Even Japan’s services sector is suffering, and the new Japan Services PMI, compiled by Markit Economics on behalf of Nomura and published for the first time on the 4th February, showed the countryâ€™s downturn deepening in January. In addition the Nomura/JMMA Manufacturing PMI survey indicated that the goods producing sector contracted at a series record rate in January, in excess of the 22.5% annual decline indicated by official Trade and Industry Ministry (METI) data for December, with plummeting export sales leading the sectorâ€™s decline. With both manufacturing and service sectors reducing employment at sharp rates in January, consumer confidence â€“ and therefore household forthcoming spending on both goods and services â€“ looks set to deteriorate further moving into Q1, dragging Japanâ€™s economy deeper into recession. 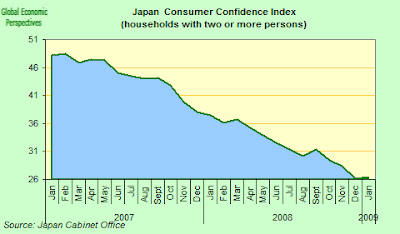 Japanâ€™s consumers remained at their most pessimistic level in at least 26 years in January (see chart below), indicating households are likely to keep cutting back on spending as the recession deepens. The confidence index nudged up very slightly 26.4 from December’s 26.2, according to the Cabinet Office last week. December’s numbers had been the lowest since the government began compiling the figures in 1982. 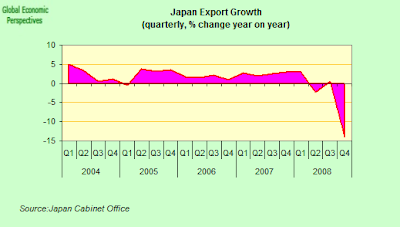 But why is Japan so export dependent? Well here you will find explanations to suit every palate, but if I can just add my 5 cents worth, I would say that the fact that Japan’s population currently has the highest median age on the planet is not simply an incidental correlate (nor is the fact that Germany has the second highest median age and is currently struggling with the same problem simply another incidental detail). Basically years of ultra low fertility coupled with relatively unfriendly immigration attitudes means that the median ages of the Japanese and German population (at 43) are now the highest on the planet. Previously it was assumed that we wouldn’t see much in the way of economic consequences from all this till much later in the century, but now, to me at least, it is obvious those consequences are already here. The consequences are, basically, to be seen in very weak domestic consumption growth, which means that economic growth (which is needed to pay all those pensions and health care costs) is totally dependent on exports, and hence the economic well-being of others. And this growth roller-coaster (which can only get worse as the median age rises further) cannot be that much fun for the population at large. One minute you have the best growth in a decade, and the next you go crashing through the floor. Ouch! So – in addition to the bank regulations fix – something also needs to be done to slow down the rapid ageing of the Japanese and German populations, and as far as I know there are only two ways to do that, get fertility up, and open the doors to immigration. In this context it is interesting to note that an 80-strong group of economically liberal politicians in the ruling Liberal Democratic Party (LDP), led by Hidenao Nakagawa, a former LDP secretary-general, are pushing for a change in immigration policy (full story in the Economist here). These venerable gentlemen are calling for the number of foreigners living and working in Japan to rise to 10m over the next half century, and for many of these immigrants to become naturalised Japanese. In addition the Keidanren, the association of large manufacturers, is also shifting position, and last autumn called for a more active immigration policy to bring in more highly skilled foreign workers. The Keidanren estimates the present number to be a mere 180,000. The Economist refers to these moves as bold, I would rather term then “baby steps” in the right direction, although we must wait and see what material outcome such pressures lead to, for good intentions have often been expressed in this regard in the past. As for fertility, again there is a lot of debate about how to encourage people to have more children, and I am sure there is no easy answer here, but I can think of one thing which would help, and that is a change in the national mindset. You see, maybe it isn’t true to say that countries like France, the United States and Sweden will have no problems with population aging, but they will certainly have a lot less than many others, since their underlying pyramids are much more stable. And you know what? Few people in these three countries would question the fact that having enough children to maintain national economic stability is important, while in the worst affected countries – Japan, Germany, Italy, Russia, China etc – we find precisely the opposite situation, with few people thinking of the fertility topic as an important one. Indeed many people in very low fertility countries attempt – often vociferously – to deny that long term demography has any economic significance at all. No wonder then, that people in these countries have less children. So when you make your long list of all the lessons which need to be learnt from all the hurting we are just about to get, be sure to remember to add this one. Numbers are getting scarier than ever. If anythign this should be a clear lesson to other countries going down the same path – A great big shock now or a series of smaller shocks for decades to come. And as if they didn’t have enough problems, check out the Rome G7 performance of the finance minister. The report is in Japanese, but the pictures speak for themselves. I know next to nothing about economics, but I do know this – when I was out in Japan in January last year I got 230 yen to the pound. This January I only got about 115. The pound may well have taken a massive hammering in recent months, but that’s surely still got something to do with it? Yes, definitely! The point is that this process, low yen during the boom, high yen during the contraction now forms part of the endogenous mechanism at work in Japan growth. Basically the low fertility/high median age couplet means they have very weak internal demand verging almost permanently on deflation. As a result interest rates are very low, which means that once global growth gets started (early in the cycle) people go to Japan to borrow money, and invest elsewhere (the carry trade, elsewhere could be Iceland, New Zealand, Turkey, Brazil, India etc) because of the very high yields available, and the relative currency movements. This drives the yen down, and exports up. Then the cycle breaks, and off we all go in an opposite direction, as people unwind there positions, seeking safe havens as risk sentiment folds. This is lose lose for Japan as the higher yen tanks exports, and economic growth collapses, you people lose their jobs, and if anything have even less children, immigrants don’t come because there aren’t the jobs, and then the median age rises further. So each cycle produces another turn of the notch, till it doesn’t and the system collapses under its own weight. OK, call that a “toy model” if you will, be it seems to me the story goes something like this. Some people may have a different point of view about all this demographic stuff. In fact, you could consider that a low fertility rate, apart from strict Ã©conomic consequences, is a very good thing : in fact, it might be the only solution (and anyway will remain part of it) to reduce the environmental disaster that we are confronted with (because it’s the only solution that we know for sure to provide a massive change in the long-term). Note that the other way to achive the reduction of environmental pressure is the chinese one : no more than one child by family. This is an excellent explanation Edward, and I suppose if you assume a simple permanent income hypothesis of spending then the middle years (which one assumes are more overrepresented in Japan than any other country) save a lot. The only thing is I assume its self-correcting as the middle group become old. GDP, ie output, will decline dramatically, and as expenditure won’t, the country will begin to run a large current account defict. Is that right? Another question (I should have added above, btw, that I’m not saying that is a desirable outcome). Why should global demand for a country’s goods be more volatile than domestic demand? Is it because of the preponderance of manufacturered goods, which are ‘essential’? Problem is, I wouldn’t live in Japan if you paid me. They don’t have a functioning justice system. Interesting topic, I gave it a good think over. And I am asking myself; why does high median ages mean very weak domestic consumption growth? More elderly inhabitants means more pensioners. When someone has a job then, apart from sleeping, he will spend most of his time working. And so he has little time left for consuming. But pensioners have much more time to spend their money. This is of course, if they have enough money to spend! Depending on the country involved, there are a few possibilities; either the ones that are working are paying for the pensioners, or the pensioners have paid for their own pensions during their working years (obliged to taking part in a pension fund), or a combination of both. In my country (the Netherlands) the latter is the case. The good thing about paying for your own pension during your working years is that the money is already there, in the pension funds. But when the workers must pay for the income of the pensioners, the rise of the median age causes a problem. Because then an decreasing amount of workers are forced to pay for an increasing number of pensioners. Therefore the German government has made the very wise measure, to increase the age that its inhabitants will enjoy their pension with a month each year, for the next 24 years (The Dutch are considering to do the same). A lot of pensioners who also are also house owners, will have paid back all, or most, of their mortgage. This is of course very positive for the pensioners finances. That is, if they donâ€™t have the mentality of the average Americans who did use their houses as a source for credit loans. So, if a country has a good pension system, I cant see why an high median age must be bad for the domestic consumption. Beside increasing the pension-age, can large scale immigration be a good measure to cope with the disadvantages of an rising median age? For the short term I think it is. But for the long term this can be a serious threat for the stability of a country. If the cultural difference between the immigrants and the autochthones stays below a certain critical level, in time there will be an high level of assimilation. But when the cultural difference exceeds a certain critical level there will occur segregation, most immigrants will prefer to stay among themselves in their own neighbourhoods. This is because when people cultural significant differ from their surrounding people, it’s hard for them to feel themselves as being part of their surrounding community. The problem is that out of this situation can easily evolve an â€œwe and themâ€ mentality. And when the country gets into a real deep crises, history learns us that this we and them mentality can eventually further evolve into most awful outcome. I think as I mentioned above the issue is not too many pensioners, that affects output not consumption, but too many people between 35-60, and who are saving for their pensions. This is not really true. The pension funds’ return depends on the rate of return in the economy as a whole, which is affected by the rise in the median age. The response to this is to send money abroad, but few pension funds do this and it can be quite risky (also of course the whole world cannot do it). Euthanasia is an obvious additional way, as well as other violent methods: war, famine, disease. You can’t have low fertility rates and a welfare state at the same time for very long. When you force one group to support another group, there needs to be more productive people than people who receive. It is not as simple as “letting more people in” or “having more babies”. Even in the United States, immigration has brought with it an inestimable number of problems including gang violence, drug wars and massive dependencies/welfare claims and entitlements. The effects are, at best, a net worth push and, at worst, an overall disaster. Japan has an easier time countrolling its border as an island nation, but its homogeneity and racial attitudes [yamato damashii] about ethnic purity mean that it is far less likely than the US to be able to assimilate anywhere near the number of immigrants. As for babies, this is a long-term economic question brought on by the fact that Japanese families look at children as economic liabilities in greater proportion to Americans (the religious of whom consider them “blessings from god” and such). Bottom line: the bromides offered and the superficial considerations behind them do your arguments no justice. There are many arguments (some valid) to increasing immigration (which I disagree with because it will bring more problems than benefits and the net result won’t provide Japan with benefits) and increasing fertility. The inherent problem (in my view) with all of these arguments is that they imply that elites and academics have the authority to do the “increasing”; that authoritarians can MANDATE these increases with the flip of a switch as if they were turning on a lamp that will predictably obey their commands. I assure you that such attempts at social engineering and economic malfeance will NOT be as predictable as you think. And the fact that advocates skip over this questionability and imply that these bromides will unquestionably work, if tried enough, means that they’re selling something. I do not believe that this recessionary trough in the business cycle should be taken as an opportunity to re-organize Japanese society. More than a few authoritarians have salivated at the sight of economic misfortune in order to come to power and “reform” society in their own image. I have no love of the Japanese culture, but the country of Japan is not “broken” and doesn’t need a “fix”, certainly not the ones your “economists” want: a massive change of the social order to be imposed from on-high elites. The best thing to do may very well be to do “NOTHING”, a valid alternative that MUST be considered by any problem solver (engineers, doctors, plumbers, you name it). It may be that we should let the Japanese people sort things out themselves. If they want more immigrants, they will petition their government. If they want more babies, Japanese couples will make more. And if they don’t want either, neither you nor I have the authority to tell them otherwise. The idea of population growth as a solution to economic problems is just pushing a problem off into the future where it will become much worse. There is a limit to how many people can live in a country and Japan has been over that limit for a long time. Many people there live in tiny apartments that Americans would think were welfare housing. When you reach the population maximum you now have every economic problem you had before, but now your country has become unlivable. Itâ€™s better to stop population growth as soon as possible and then let the population level gradually fall back to a sustainable level. Today we have a system which redistributes in favour of the childless, right? I’m no economist, but aren’t children just positive externalities? The only thing is I assume its self-correcting as the middle group become old. GDP, ie output, will decline dramatically, and as expenditure won’t, the country will begin to run a large current account defict. Is that right? Your intuition is quite right Matthew; an aggregate life cycle model (Modigliani, and not Friedman although they are comparable I think) would suggest that as an economy moves through the stages of ageing dissaving will set in and at some point domestic investment will not be met by domestic saving and thus the economy will need to import capital from the outside world; this however assumes that the “capacity” for the economy to maintain investment is constant which is clearly not true). Thus, let us think about this for a moment. First of all, while we have AGGREGATE dissaving this does not mean that everybody is dissaving. Basically, I think your point about expenditure may not necessarily be true since the working cohorts will tend (I think) to save much more than would otherwise have been the case if the population pyramid had been more stable. There are two mechanisms to think about here. One is that the government may be forced to slam on taxes (forced savings) to finance the growing old age dependency and another similar mechanism is simply that people save because they realize that they need to built their own nestegg because whatever mandatory and public provision set in place won’t do. Interestingly, this kind of saving may actually be one of those famous leakages since you still have, as a function of the declining capacity of the economy, low domestic interest rates (return) and thus those savings will be sent abroad. Witness in this respect the quite drastic decline in Japan’s home bias which has ocurred in this decade. Note especially the (I+X) on the left hand side of the last equation. This is basically national saving. Now, let us neatly leave aside endogenity issues here (i.e. how e.g. does I react to X and vice versa?) and simply realize that as “I” declines due to a decline in domestic capacity you can increase X and still keep savings and thus output constant or better put try to compensate for the decline in C, G, and “trend” “I”as the population ages. This is exactly what we are seeing in Japan and Germany and my humble argument is that waay before Japan will ever run a current account deficit the BOJ will print so many JPYs and/or the Japanese economy will simply default on its government debt. Basically, Japan is at a tipping point at the moment and as long as you can earn income of off foreign assets and sell your excess capacity abroad you may limp ahead, but once you starte nearing a current account deficit (i.e. allow the economy to decline with the old age dependency ratio) you need, as it were, to mark the Japanese economy to “market” (and not to those silly neo-classical growth “models”). This is equivalent to say that the balance sheet of Japan would have to shrink equal to all that debt held internally by domestic investors because there are simply no future revenues to sell. Interesting topic, I gave it a good think over. And I am asking myself; why does high median ages mean very weak domestic consumption growth? More elderly inhabitants means more pensioners. When someone has a job then, apart from sleeping, he will spend most of his time working. And so he has little time left for consuming. But pensioners have much more time to spend their money. Sorry Ron, but I think this is too simplistic. Basically, we need to incorporate some kind of life course framework here too which is to say that people in their 30-50s are not only in their peak earning years but also in their peak spending years (buying houses, cars, durables and non-durables etc). Of course, and this is the point … if there is an increasing old age dependency ratio, then these people may be forced to save more to compensate for the dissaving of the elderly. And here comes the silver bullet! When a country such as Japan has gone through this many years of below replacement fertility and rising life expectancy (which is a virtue by the way), then the working cohorts will be smaller than the non-working cohorts so the former will need to save more and more to compensate for the dissaving of the latter. Moreover, I don’t think that we should think about pensioners as affluent individuals as A RULE. Also, we should consider the fact that since people don’t know when they will die, they cannot dissave to zero even if this infamous transversality condition in macroeconomics suggests this. Finally, there is simply more bang for the buck in spending by people aged 30-50 than 50+ (well, health care is a notable exception of course) and this is why Japan suffers. And here I haven’t even talked about productivity profiles of workers and creative destruction as a function of a stable and high amount of workers in their “prime”. ok, I hope this answered some questions although I myself am not certain of any of this. Well I have basically stood back a bit here, and let Claus come in with something, which he has now done, since basically his research is much more focused on the Japan end of the problem than mine is, so I thought his answer might be more informative. Basically, I don’t think either Claus or I would directly disagree with the thought which lies behind this. I mean to some extent it is inevitable that the planets population start to shrink, and it is useless to kick abainst processes which are inevitable. But let’s try and think inteligently about all this for a moment, and go back to the point about Japan’s very low interest rate environment. A very good case could be made for the idea that (via the carry trade and Japan’s liquidity provision) the internal lack of demand in Japan is being transmitted across the global economy in the form of excess liquidity, and asset bubbles. Now, I don’t know if you have all been noticing, but aren’t we all having something of a problem with all of this in a number of countries right now, as asset bubbles have been bursting. You see, what Claus and I have is only a hypothesis, but what is happening tight now in China, Japan and Germany is giving us quite a lot of grist to our mill. Now China’s problems are not exactly the same as Japan and Germany, since the median age is in fact much lower, but they do have a massive, and self inflicted, structural break in the population pyramid, and they do seem to be hhaving great difficulty generating autonomous domestic demand. I’m not quite sure how this is working, since as I say it is different from the other two, but there is something fishy going on. I mean, it can’t be pleasant having what is just happening to China right now happen to you, and I can’t help feeling that if they had a more stable population pyramid (and better institutions, of course), then we wouldn’t all be out on the roller coaster, but we are, and none of us are going to enjoy it. And of course, I have mentioned China, since by buying all those Treasuries, the Chinese are directly behind the excess US liquidity situation. So we can all agree that the global imbalances are a bad thing, but what to do about them. Well this is where I can’t agree with Zachary’s original idea, since I don’t think (omg, we are back to the same point) that just because we are all dead in the long run that doesn’t mean we can’t do anything in the short term to make our lives a bit easier, like freeing up population movements to some extent, and supporting who really do want to have children. Of course, there may be some among us who just like rollercoasters for the hell of it. Pingback: Bloodstar » It’s a Global Economy, so Worry. With this I wanted to explain that we cant draw any decisive conclusion about the effect of the rise of the median age on the domestic consumption growth of a specific country, if we donâ€™t know how they managed their pensions. Because when the pensioners have already paid for their own pension during their working years, they are not a burden on the income of the people that are still working. Well, I donâ€™t know what measures were taken in Japan to provide an income for their pensioners, but if there the people in their working age have to pay for their pensioners, then they are most likely to face an decrease in their domestic consumption of course. I know this is complicated, but doesnâ€™t buying houses contradict with the grow of the domestic consumption? I mean when someone has enough money to buy a new house I donâ€™t doubt that this contribute to the domestic consumption. But a lot of people wont have enough money, so they have to take a long term loan (mortgage) to buy a house. Lets say that someone has a mortgage that oblige him to pay 500 euros each month for a 30 year period. So this person has for the next 30 years 500 euros each month less to spend (to consume). The buying of the house has thus an minus 500 euros effect on his monthly income. When in time this person becomes a pensioner and he has completely paid back his mortgage, he has every month 500 euros more to spend. What do you think about the measure of the German Government to gradually raise the pension-age a few years. Do you think this can also be an solution for the Japanese situation? I think of population growth the same way I do deficit spending. It isnâ€™t a problem as long as you do it for limited periods of time and eventually return to the same population level/balanced budget you had before you started. The problem is when it becomes a permanent long term solution to problems that a country would rather not deal with. Itâ€™s really a pathological solution rather than a rational solution. I think this occurs because there are plenty of people around who are quite happy to pursue solutions that solve their immediate problem, but at the expense of having severe long term problems. Itâ€™s really a live for today attitude from people who arenâ€™t paying attention to the ultimate effects of their actions or who donâ€™t think it will eventually catch up with them. Those of us living and working in Japan since the bubble burst have enjoyed fairly stable prices. Subway and bus fares in many places haven’t changed but the number of people sleeping in blue plastic tarp structures is up. People in rural Japan probably have more children: it’s cheaper to live there and homes are bigger; unlike postwar Japanese, few today are willing to raise a couple of kids in a one- or two-room flat in Tokyo. My brother-in-law, a Japanese exec, wakes at 5am and often doesn’t come home until 11pm or midnight. That’s when his company doesn’t have him at some distant plant, domestic or international. When does he have time to make children? There’s the “parasite single” phenomenon, too: mainly young women who live at home with parents (no rent) and spend all their money on themselves, saving little or nothing. Widespread belief that the national pension system will take care of everyone is touching but crumbling visibly. Young people are dodging paying into the system. Foreign nurses for the elderly are being brought in and, in some cases, apparently being paid more than Japanese for the same work. Toss in the interesting case not too long ago of a woman in her 70s who stabbed a girl at random. The old woman wanted to go to jail because she would be taken care of there. The national pension system finally changed to allow pensions to be taken anywhere. As a result, there are periodic bursts of media coverage about Japanese-community retirement facilities in Thailand, Malaysia, and the Philippines. You can live on Â¥40,000/month in Thailand; you effectively cannot in Japan. Something that may be exacerbating the volatility here is that when you have a manufacturing-dependent economy among a relatively wealthy, skilled population, your manufactures skew towards higher-value, lower-volume goods that can’t just be made anywhere. But these are exactly the purchases consumers defer first (and perhaps defer indefinitely) when their finances dry up. To increase fertility, based on recent US experience all you have to do is stagnate/decrease standard of living. First we tried it with our welfare recipiants and it worked (fertility in this cohort went up as cash transfers went down.) With the introduction of offshoring and the opening of our southern border, US household income has been stagnant for some time, and the preasure on households is up dramatically. Most recent live birth data shows the fertility rate is up for all age/demo combos. Our government seems dedicated to us not turning Japanese, even if it has to make us most of us poor to do it, and is get’ner done.